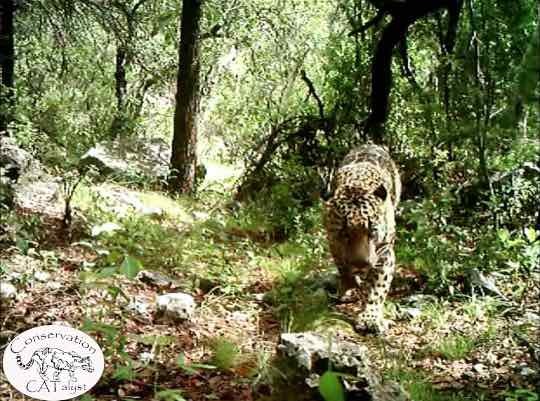 This screen grab from an online video shows "El Jefe," a male jaguar, in the Santa Rita Mountains of Southern Arizona. A video released this month shows the only jaguar known to be in the United States — and it's roaming the mountains of Southern Arizona. The footage, shot using remote sensor cameras, is from the Santa Rita Mountains northeast of Nogales. The cameras captured "El Jefe," as the male jaguar has come to be known, both during the day and at night. It's the first video of the animal to ever be publicly released. The Center for Biological Diversity, a conservation group based in Tucson, released the footage, calling it "a glimpse of the secretive life of one of nature’s most majestic and charismatic creatures." The organization is working to protect the jaguar's Arizona habitat, which it says would be threatened by the proposed Rosemont copper mine. This jaguar is the only one that has been been verified to be in the U.S. since 2009, when "Macho B," another male jaguar, was euthanized after suffering capture-related injuries, the CBD said. The last female jaguar in the U.S. was shot in 1963 by a hunter on the Mogollon Rim. The species' history in the state was the focus of Spotted in Southern Arizona, an April 2014 Arizona Highways story by Ruth Rudner. You can watch the video of the elusive jaguar by visiting the CBD's Facebook page.